The Canadian Staff Band (Bandmaster John Lam) visited Mountain Citadel in Hamilton, Ontario, on the weekend of 7 – 8 February 2015. The weekend included the 2015 installment of the annual Blazing Brass concert series, a music festival on Saturday evening, and Sunday morning worship. The annual Blazing Brass event features an afternoon of half-hour mini-concerts by corps bands from around the area. The Staff Band presented two contrasting items, Pound the Streets (Paul Lovatt-Cooper) and Skydance (Martin Cordner). This was followed by items from Brantford Corps Band, Etobicoke Temple Band, Mountain Citadel Band, London Citadel Band, and first-time participants Simcoe Citadel Band. 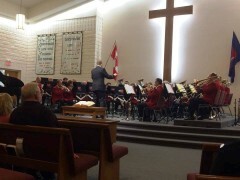 The Saturday evening concert featured the Staff Band, the Ontario Great Lakes Divisional Youth Chorus and Mountain Citadel YP Band. During the first half of the program, items from the Staff Band included Saints of God (James Curnow), On We March (Kevin Larsson), My Tribute (featuring flügelhorn/trumpet soloist Doug Chaulk), and a new trombone solo, Your’re Always There (Andrew Wainwright), which was written for and played by Craig Lewis. As a tribute to the late composer Ray Steadman-Allen, who died just before Christmas 2014, the Staff Band performed his classic air and variations Go Down Moses. Following the intermission, the Staff Band continued with Boundless! (Kevin Larsson). The trombone section was featured in Trombone Vespers (Ray Steadman-Allen) and Steve Pavey offered Chris Mallett’s euphonium solo Travelling Along. A new piece by Craig Woodland, Be Still, was also included. The concert concluded with The Last Amen (Peter Graham). The Divisional Youth Chorus and Mountain Citadel YP Band also performed well. The evening was a fundraiser to send young people to summer music camp, with $1,700 being raised for this worthy purpose. On Sunday, the Staff Band shared in morning worship, which was led by Executive Officer Major Kevin Metcalf. Following a prelude, which included the E♭ tuba solo Sweet Hour of Prayer (Jonathan Rowsell) played by Noel Samuels. Band items during the meeting included a new song arrangement by Noel Brooks, His Strength Is Perfect. The band sang Jesus, Thou Art Everything to Me (arr. William Himes) with Bill Way at the piano. This article was posted in News and tagged Bill Way, Blazing Brass, Brantford Corps Band, Canadian Staff Band, concert, Craig Lewis, Doug Chaulk, Etobicoke Temple Band, Hamilton, John Lam, Kevin Metcalf, London Citadel Band, ministry weekend, Mountain Citadel, Mountain Citadel Band, Mountain Citadel YP Band, Noel Samuels, Ontario, Ontario Great Lakes Divisional Youth Chorus, Simcoe Citadel Band, special event, Steve Pavey, worship on 1 May 2015 .